Beyond Scandalous Selfies: Documenting Anthony Weiner's Downfall A new documentary shows the rise and fall of the former congressman with unimaginable access. Co-directors Josh Kriegman and Elyse Steinberg explain how they got the story. This image released by IFC Films shows Anthony Weiner in a scene from the documentary, "Weiner." If you're from New York City you might think of him first as the congressman from Queens who never backed down from a fight for the city or its people. "I will not yield. I will not yield," he once said. But if you are not from New York - and let's face it even if you are - what you probably remember most is the bulging underpants, the famous photo, published from the congressman's public Twitter account that made him a household name and a punchline back in 2011. Anthony Weiner resigned from Congress and his public profile might have ended there, but it didn't. Two years later, Weiner was back in the public eye running to be mayor of New York City. He let two filmmakers follow him to capture what he'd hoped would have been his triumphant return. That, however, didn't go as planned either. "I made mistakes that embarrassed myself, hurt my family," Weiner apologized, "for that I am profoundly sorry ... But at the end of the day this campaign is not about me." This is all captured in a new documentary which was released last Friday entitled, Weiner. The co-directors of that documentary are Josh Kriegman and Elyse Steinberg and they may have given us one of the most intimate and detailed portrayals of political failure in modern American history. 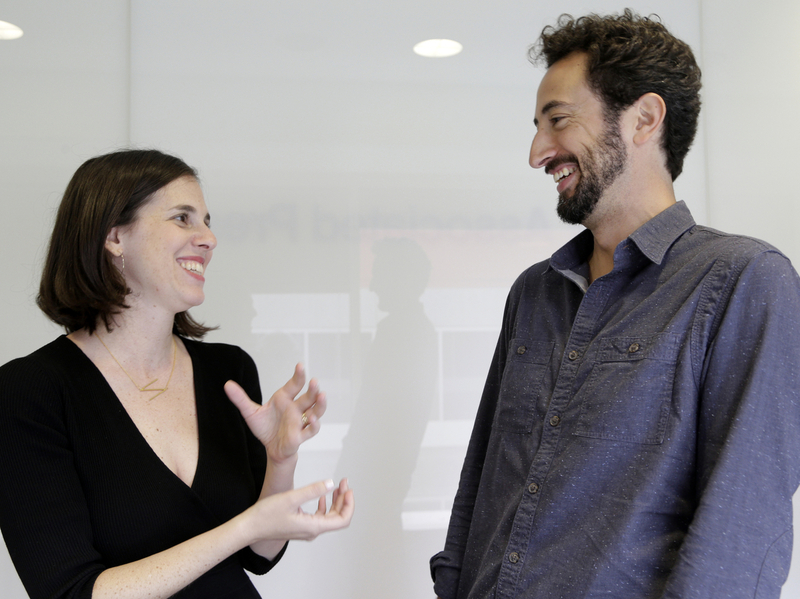 Elyse Steinberg (L) and Josh Kriegman, directors of the documentary "Weiner," appear during an interview in Los Angeles on Tuesday, May 17, 2016. Kriegman and Steinberg spoke with NPR's Michel Martin. Josh: I did meet him working for him in Congress, when I was working in politics. And then, after leaving politics, I moved into filmmaking and started working with Elyse. It was after his scandal and resignation that we started a conversation with him about the possibility of making a documentary, figuring out if there might be a story to be told that kind of gets past the punch line version that he became through the course of his scandal. And that was a conversation that I had with him that really went back and forth over the course of a couple of years, actually, until he decided that he was going to run for mayor of New York City. And it was on that morning that he announced he was running, that he actually sent me a text early that morning, saying he was in the race and if I wanted to come with a camera to shoot for the documentary, I could. And of course, I said I'd be right over and literally ran over and started filming from the first day that he announced he was running, all the way through to the end of the election. Elyse: It's one of the questions that Josh and I wondered about ourselves, and it's actually a question that we posed to Anthony. And he does give us an answer when he says that he wanted to be viewed as the full person that he was, instead of a punch line. And that was our intention going into the film. Josh: Part of it was he embodied this sort of ethos of being a happy warrior for the progressive left. You know, one of the ways that he became well-known — actually, ironically — was through using the tools of modern media, like YouTube and Twitter, and understanding how to mix it up on cable news in ways that went viral. He was brash, he was aggressive, he wasn't afraid to speak his mind. And that was something that really spoke to many on the progressive left who were eager, I think, for that kind of voice. Josh: This was, of course, of his own design, and he had no one to blame but himself for what happened to him. But nevertheless, he really was — through the course of this scandal — his entire 20-year career was really reduced to this one thing, to this punch line. Anthony Weiner (L) and Huma Abedin arrive at The Metropolitan Museum of Art Costume Institute Benefit Gala on Monday, May 2, 2016, in New York. Josh: He is speaking to an aspect of his character that served him well in politics, actually, was thriving in this world of transactional and superficial relationships. And craving and needing attention and affirmation — you know, that's part of what made him successful as a politician. And on the flip side, it's the same characteristic that ultimately led to problems in other aspects of his life where he says he wasn't able to connect with on that deeper level and was engaging in these online, virtual relationships like he was playing a video game is how he describes it. Elyse: I think in our film, viewers get to see a more multifaceted side of her. She's a wife, a mother, a person with a really important job, who has been a political professional for decades and you get to see that. On if they asked Weiner's wife why she "puts up with him"
Josh: No, I don't think I ever did. There are a few moments in the film she and I have some exchanges about how she's feeling in the moment and how the campaign is going. But our hope with the film is that you see they're a complex and nuanced couple like any other and it doesn't necessarily boil down to easy answers. Our hope for the film really is that it does get beyond just Anthony and Huma's story and this one mayoral campaign in New York City and really speaks to this larger question of where we are in our politics today. And specifically how much the political conversation really is driven by spectacle and sensationalism and this appetite for entertainment. And of course, you don't have to look very far to see that playing out in a phenomenon like Donald Trump. You know, I think Anthony Weiner and Donald Trump are very different people and obviously they're on different sides of the political aisle. And I think Anthony has a kind of ideological core and knowledge of the issues that I'm not sure Trump has expressed. But at the end of the day they both seem to understand what seems to have become kind of like a fundamental truth of American politics today which is that to have a voice in the conversation you sort of have to figure out a way to put on a show. And so, our hope is that this film and watching Anthony's campaign you get a chance to see some of the realities of what's going on in our politics today.